One of my favorite things to sew my girls is dresses. Their tall thin frames make finding RTW dresses that are the right length almost impossible to find. Dresses can be a quick sew or a slow thoughtful process. Either way, the result is always so worth it. With Easter just around the corner, I’m here to share some of my favorite tried-and-true patterns and designers. The Manhattan Dress from New Horizons Designs is a fast sew with stunning results. It’s a boatneck, fitted bodice with multiple sleeves and skirt lengths. It’s made for knits which makes it as comfy as it is pretty. This one comes in a HUGE range of sizes, 6-12 months all the way to size 16 (with a ladies version as well!). Another knit favorite is the Aria Dress from Simple Life Pattern Co. The bow back detail really makes this pattern a show stopper! You can add the back panel for warmth and modesty or leave it off for summer. It’s such a great pattern for mixing fabrics too. This pattern goes up to a size 12 making it great for tweens too. The Groove Dress from MadeIt Patterns is a great staple pattern. The wide swing style is so fun and you just can’t help but twirl in it. The kid’s version goes up to size 10 but you’ll also receive the Tween pattern with purchase so you’ll be set for awhile! This pattern would be perfect for casual Easter parties and works great in all those drapey double brushed poly and rayon spandex prints. My last go-to knit dress I can’t live without is the Joy Dress and Peplum from Made for Mermaids. This pattern looks fantastic with more structured knits like ponte, liverpool, and scuba. Those big deep pleats are to die for! This is another pattern that comes together in a flash but leaves a big impact. It’s available up to a size 14 (and also in women’s) which means my girls will be getting them for years to come. Whenever I have a woven fabric I want to really highlight, my brain goes right to the Violette Fields Threads Pixie Dress and Top. I love it for mixing prints and also playing with fabric direction and trims. As far as woven patterns go, this one is one of the simplest to sew up. With no closures to worry about, I can sew it up in an afternoon. The Pixie dress is available in both children and tween sizing so I know we’ll be covered for awhile. Violette Fields has an extensive tween pattern collection that I find myself turning to again and again. Coffee and Thread Patterns are some of my most used patterns. The Polina Dress has just enough frouf for my girls but is still classic enough for me. Coffee and Thread Patterns go up to a size 12 and I’ll be sad when my girls outgrow them. They are a little more sophisticated and the tutorials and fit can’t be beat. 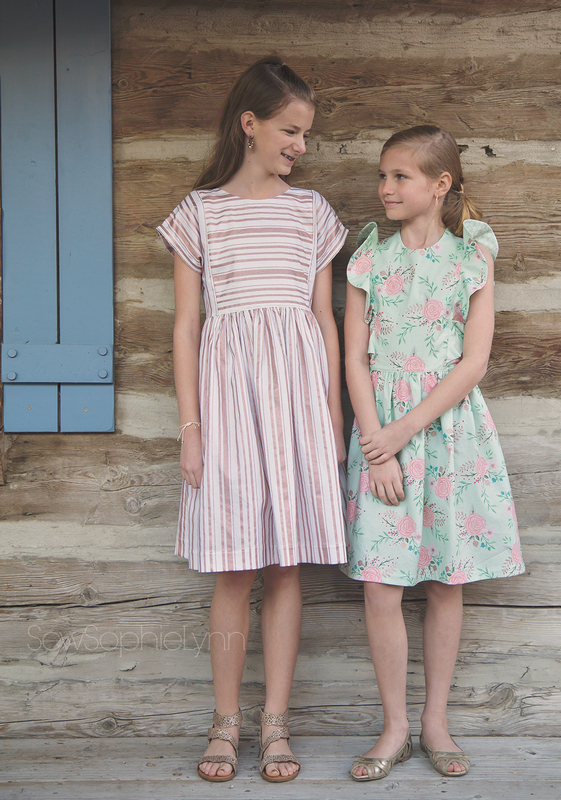 The Larkspur Dress from Hey June Handmade is my workhorse pattern. I’m a sucker for the whole Hey Juniors line- a collection of wardrobe staples in sizes 6-16 that can be such a great base for classic pieces or pattern hacking. The Larkspur is a classic shift dress silhouette that totally changes depending on the fabric. A beautiful satin version was perfect for my little ladies special day. A simple blue linen variation has me coveting her dress collection and it also makes a great base for those cute quilting cottons you fall in love with. Are you sewing Easter dresses for your girls? What are your go-to patterns? Do you go extra fancy or keep it comfy? My girls will have a closet full to pick from this Easter!